Fellowes Standard Monitor Riser - Up to 60lb - Up to 17\" Monitor - Platinum, Graphite - Desk-mountable - Welcome to TABS! Space beneath platform can store papers. Nonskid rubber feet ensure stability on any surface. Riser holds 21\" monitors up to 60 lb. 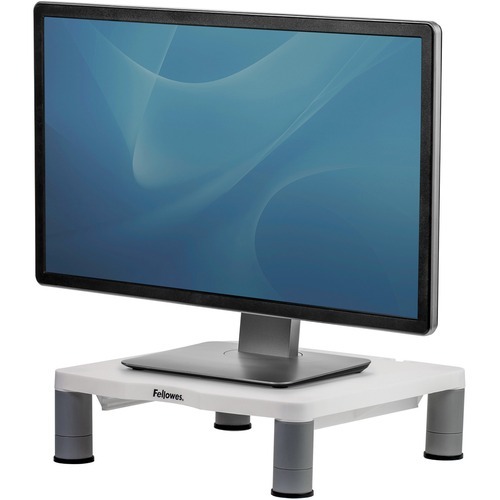 Monitor riser is designed for use on desktop or on top of a CPU. Innovative stacking columns adjust to three different heights (2\" to 4\") to position monitor. Space beneath platform can store papers. Nonskid rubber feet ensure stability on any surface. Riser holds 21\" monitors up to 60 lb. and features convenient cord management. Country of Origin: China Depth: 28.3 ft 13.5" 13,5"
Form Factor: Desktop De Escritorio Height: 102" 4"
Maximum Screen Size Supported: 21" Minimum Adjustable Stand Height: 2"
Product Type: Monitor Riser Elevador para monitor Width: 28.3 ft 13.1" 13,1"